Polaroid used to be the craze when people could take instant photos and see them turned out immediately before their eyes. This was convenient for tourists and cool for youngsters at that time. However, Polaroid has since faded in popularity and been replaced by other gadgets. Fujifilm is set to revive the popularity of the instant film and target it at a new market – real estate agents, law enforcement professionals, etc. – by introducing the instant camera, Instax 200. 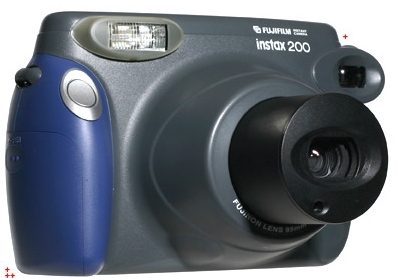 A quick snap with Fujifilm Instax 200 will instantly print out high quality photos on the spot within a short while. The body of this Instax 200 weighs 650g and it is 178.5x 94.5×117.5m (WxHxD) in dimension. The design of this instant camera is near rounded in shape and it is easy to hold with the side grip that comes along. The Instax 200 features a built-in auto-adjusting flash (flash range from 0.9m – 3m), a reverse Galilean style viewfinder, high-resolution retracting collapsible-mount Fujinon lens (2 components, 2 elements, f=95mm, F=14), and two range options for shooting (0.9m to 3m & 3m to infinity). Fujifilm’s Instax 200 runs on 4 x AA size alkaline batteries which can last for 10 packs of film. This instant camera uses FUJIFILM Instant Color Film “instax”. The film size is 108(W) x 86(H)mm while the picture size printed out is 99(W) x 65(H)mm.